One of the things that sets us apart at Aztec Design is that we care about our clients and we will strive to produce a website that they can be proud of. 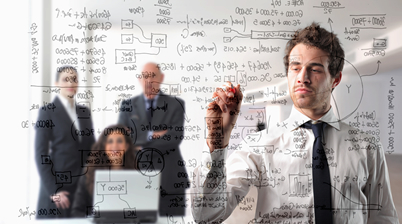 We can easily setup new company emails, modify a site, make changes to marketing material or switch domain names. Our services are very affordable and our end results always satisfy. You can view just some of our ever growing list of clients below and see some of the work we done in conjunction with each of them. Ireland's largest indoor Karting arena, a choice of three 360 metre tracks with flyovers, underpasses, hills and banked corners. Experience the thrill of real racing on three indoor circuits. 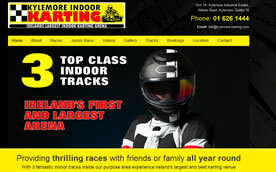 Kylemore Karting, established in 1992 as the first indoor track in the Republic of Ireland, is now Ireland's market leader in indoor Karting offering a combination of high-spec equipment, first class facilities including a choice of three 360 mtr tracks with flyovers underpasses, hills and banked corners. Maori Sports specialist suppliers of high quality fully customised performance Sportswear for Rugby, Hockey, Soccer, Gaa, Basketball and all other sports. 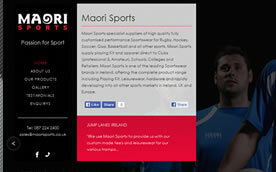 Maori Sports supply playing Kit and apparel direct to Clubs (professional & Amateur), Schools, Colleges and Retailers. Maori Sports is one of the leading Sportswear brands in Ireland, offering the complete product range including Playing Kit, Leisurewear, hardware and rapidly developing into all other sports markets in Ireland, UK and Europe. 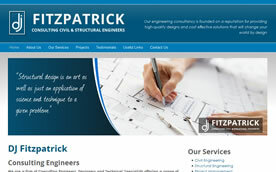 DJ Fitzpatrick are firm of Consulting Engineers, Designers and Technical Specialists that specialise in civil and structural engineering design and CAD services in the engineering sector. The company also offer design / build services, project management and construction management services in the construction sector. Tullly School of Motoring, otherwise known as Arklow Driving School can tailor your driving lessons to your exact needs, whether you are new to driving and require the full EDT course,or you are a more advanced student and require pre test lessons. 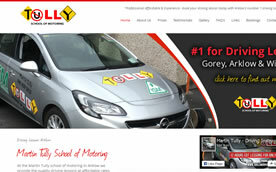 The new website for Tully School of Motoring features a Facebook feed, online bookings and and online payment feature. 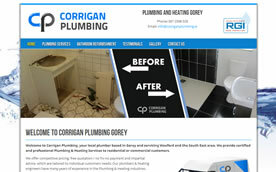 Corrigan Plumbing provide plumbing and bathroom refurbishment services throughout Gorey and beyond. Robbie Corrigan, business owner has provide numerous propertys with an upgrade of older bathrooms into more modern bathrooms fitted to suit clients requirements. Along with the website Aztec Design provided Robbie with a new logo and branding to take his business forward and improve its online presence. 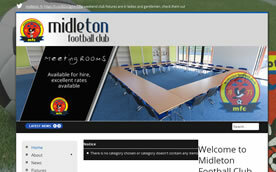 Midleton FC are a football club in Cork that cater for children and adults of all ages. The club boasts extensive facilities and a dedicated backroom staff who work endlessly on the development of the club. The new website for Midleton FC provides for the club admins to easily display match reports, club news, lottery results and upcoming fixtures. 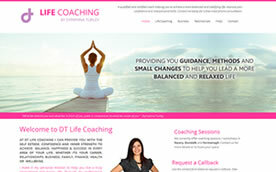 DT Life Coaching provide the best in life coaching and career coaching in Newry and beyong. With regular workshops in Dundalk, Newry and Fermanagh get in touch with Dymphna today and see how to make positive improvements in your life. The website for South East Chambers is a revamp from a previous website and was created with stock images, a responsive design and printwork to compliment the website. MC Security provide a range of security system services throughout Gorey and beyond. With an extensive range of security products of all types they can assist in the monitoring and security of your business premises or residential property. 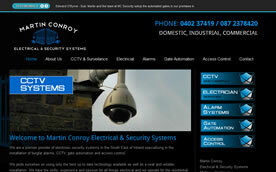 The website for MC Security was built in a short timeframe, based on the companys requirements and specs. Brian Lancaster provides Boiler Services as well as plumbing services throughout the Gorey area and beyond. Brian has built up an excellent reputation for his professional services, friendly manner and attention to detail. 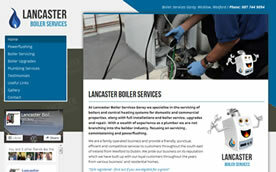 Lancasters Boiler Services features a Facebook feed, a responsive design and a testimonials section which can be added to. Wicklow Farmhouse Cheese are one of Ireland's top cheese suppliers. From a family run farm in the garden of Ireland Wicklow Farmhouse Cheese have won numerous awards for their tasty collection of artestian cheeses. 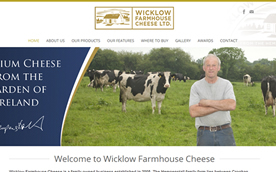 The website for Wicklow Farmhouse Cheese was updated and revamped to the highest specs, and now features a mobile phone version, an awards page and an effecive homepage slideshow as well as photo gallery and contact form. Delta Karting are one of Ireland's top Go Karting experiences. With 2 award winning tracks and a children's track Delta Karting can cater for people of various ages and offer differing packages and race types. 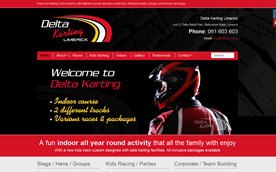 The new Delta Karting website was revamped based on their old website. It now features a booking form, a photo gallery, a collection of videos and a page to list visitors testimonials. 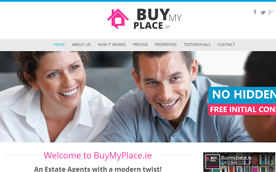 The new website for BuyMyPlace was created in a short period after an upgrade from an old website. It features a portfolio of property s which is easy for the administrators of the website to manage and focuses on a lot of social media integration. Meadow Park Duck Eggs provide Ireland's best duck eggs and can be found throughout various stockists throughout Ireland. The duck eggs are tasty, nutricious and much larger than regular hen eggs. 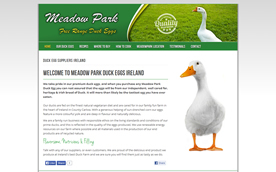 The website for Meadow Park Duck Eggs Ireland features some of the owners recipies, and information about this family run farm in the South East of Ireland. Visit it today and find out more. Jodie at Wild & Natural is passionate fine and natural foods. The Wild & Natural deli in Rosslare caters for breakfast, lunch and bakery for those looking for superior foods at the best prices. The premises also stocks some of the finest supplies of local artesian produce in the south east. 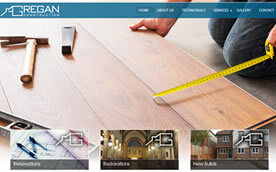 Keelon Limited provide a range of carpentry services throughout Wexford and beyond. With a portfolio of projects complete from small to large Keelon Construction and Carpentry can offer you exceptional quotes for any construction job. 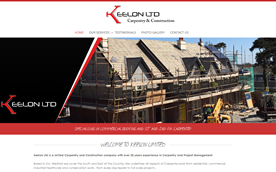 The Keelon website was build after consultation with Keelon's management team, who provided great input on the job. The website also features various photo gallerys. 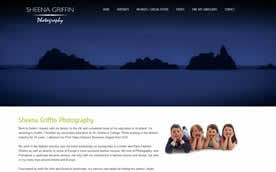 Sheena Griffin provides photography services throughout County Wicklow and beyond. With a state of the art studio in Kilcoole Sheena offers a variety of different photography packages for weddings, family portraits and landscape shots. Sheena's website was created using a popular content management system, allowing Sheena herself to easily update it and add more images to the photo gallerys. 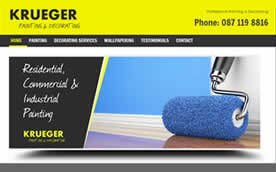 Krueger Painters provide Painting, Decorating & Wallpapering services in Gorey and the surrounding areas. With a wealth of experience and expertise if you are thinking about decorating your home get in touch. Terraclean is the only de-carbonising service of its kind, providing customers with a cleaner and more efficient motoring experience. 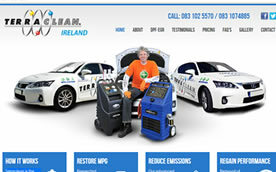 A service with Terraclean with increase your vechicles MPG, reduce emissions and improve performance. 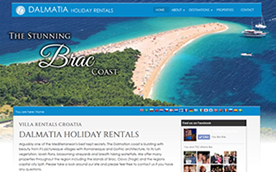 Dalmatia Holiday rentals provide a range of top quality holiday and vacation homes through Croatia and specifically in the stunning Dalmatia region. With a range of villas, apartments, townhouses and more be sure to visit the website and see whats on offer. The new Dalmatia Holiday Rentals website features various photo gallery's, a language selector, contact form and information about activity's and transfers in and around the region. 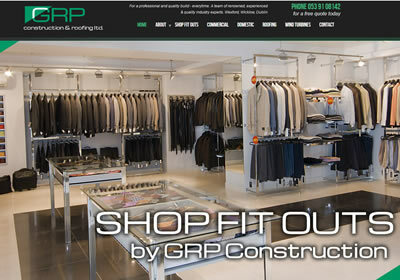 GRP Construction provide a complete range of top qualify building services through Gorey, Wexford and the South East. Paul Moorehouse who runs the company has extensive experience in the building and window trade and can provide competitive quotes with guaranteed top class work. 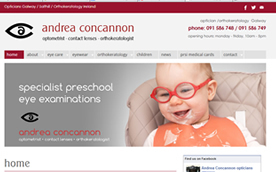 Andrea Concannon has provided a range of professional eyecare services in Galway since 2002, delivering a professional, friendly & attentive service focused on the health for her clients eyes. Andrea also specialises in Orthokeratology and offers a complete range of such services. Aztec Design provided a complete new website for Andrea that combines both her previous websites, with a blog, frequently asked questions and a wealth of optical information. 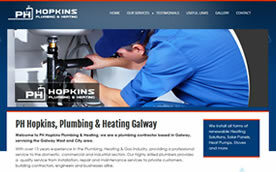 Patrick Hopkins Plumbing provide a variety of plumbing and heating services throughout Galway and beyond. If you are looking for boiler maintenance, water treatment, heating services or gas and oil services get in touch with PH Plumbing Galway today. A Gregan Construction provide construction and building services to customers throughout Wexford and Dublin. With renowned Pat and Rossa leading the way the team at A Gregan have exceptional skills, experience and expertise in all things construction, with restorations, renovations, extensions and rooting some of their core services. 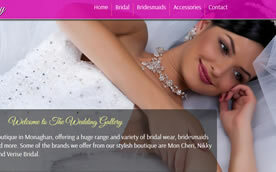 Aztec Design built a website based on one of the owners requirements. We worked with the company to custom tailor each page and add a sliding photo gallery for each of their core services. 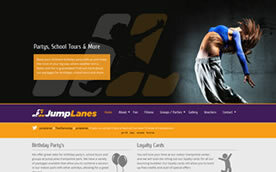 Jump Lanes Trampoline Parks are a group of trampoline parks throughout Ireland. The centre's are great for a family day out for for a fun form of fitness and they offer a unique trampoline bed system with lengthy lanes rather than small square box's more commonly used in trampoline parks. 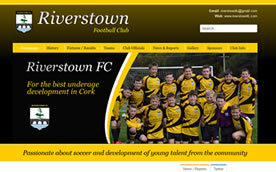 Riverstown Football Club are a schoolboys and schoolgirls amateur football club based in Glanmire, County Cork and providing for the best underage training for children in and around the area. 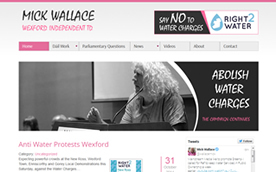 Mick Wallace is an Independent Wexford TD and businessman who is active on a number of fronts and campaigns. After topping the polls in Wexford during the last general election Mick has proven his worth in Leinster house as a tireless campaigner and representative for various organisations and groups. Mick's new website features a video page where you can view his various Daíl speeches as well as a comprehensive blog and social media feeds. There is a section with upcoming events and various news articles for visitors to read through. James Farrel of JF Carpentry offers the number one carpentry services in Wexford along with various PVC and maintenance services. The professionalism and quality of work the JF Carpentry team can provide cannot be beaten and you can read through the testimonials for words from satisfied customers. 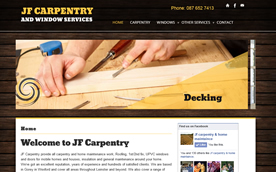 The website for JF Carpentry uses an original Aztec Design designed Joomla template to suit the carpentry trade and James's preference. It features sections for testimonials, a Facebook feed, image gallery and more. Breda Murphy is a talented makeup artist operating throughout the south east, from Wexford to Kilenny. With Breda's talent and experience she has the skills to make the most of your special day or any other event. 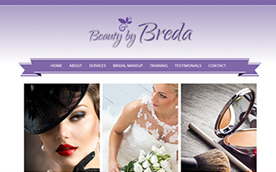 The website for Beauty by Breda was developed along with the branding, colours and images in which Breda herself provided her input and requirements. 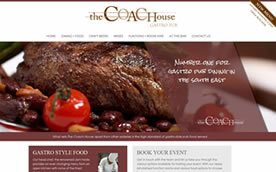 The website can be easily updated from editing while viewing the website once logged in. Jer and Anita Gibbons offer the best in photography for weddings, portraits and more from their custom designed studio in Carlow town. With a wealth of experience and some fantastic packages available be sure to visit the new website or pop into the studio during regular business hours. 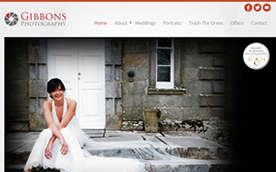 The new Gibbons photography website features individual gallery's, testimonials and various photography packages. The website is very easy to update and to add new image gallerys. Kymaia is the website of talented fashion designer Kabira Allain. Kabira use's her mixed Afrian/French roots to develop her fantastic range of women's wear. Kabira came up with the design concepts for her website and Aztec Design were happy to develop a website based on her sketches, a website using a content management system so Kabira can easily make updates. Adman Steel Sheds provide Ireland's best garden and steel sheds, engineered to last and manufactured in Gorey, Co. Wexford. With display area's nationwide and the best build steel sheds the company have developed in the premier steel shed provider in Ireland. 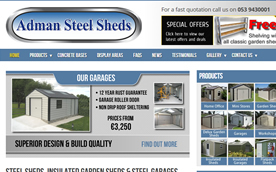 Aztec Design provided Adman Steel Sheds with a new content management system to manager their website. While this new website looks identical to their old website there is no a system in place allowing the team at Adman to update the website themselves. 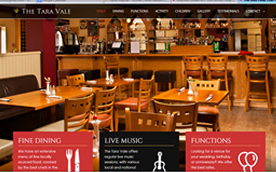 The Tara Vale is a bar, restaurant and reception venue in Ballymoney, just a short drive from Gorey. The restaurant serves the best in food and caters for people of all tastes, with a children's playroom just one of the attractions of this local landmark. 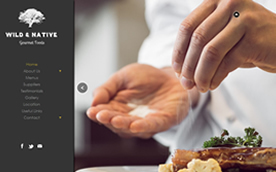 The Tara Vale Restaurant and Bar now has a website that is can utilize to interact with visitors, to promote their locally sourced fine foods and to allow visitors to make bookings or get directions. Anita Conroy is a talented and makeup artist who who has risen to the top of Ireland's top artists. He hard work and dedication has seen her perform her magic for the stars and regularly in magazine shoots. Classic Wedding Car Hire are Wexford Longest running and most valued wedding car hire service. With a range of different packages, a choice of drivers and of course, a very rare and stunning car for your big day Classic Wedding Car Hire should be one of your first calls when arranging your wedding. 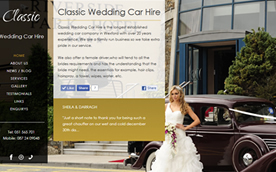 The new website for Classic Wedding Car Hire offers a background slideshow, a mobile phone version and more. The homepage has scrolling testimonials so they don't take up much space and there are various social media features. 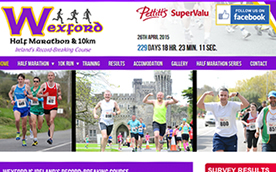 The Wexford Half Marathon and 10km road race is Ireland's flatest road race, and is part of a series of fun runs organised by the same team that bring you the Wicklow Half Marathon and the Clontarf Half Marathon. The race attracts huge crowds and is a must for all joggers of all levels. At Aztec Design we gave the old website a revamp and made it easy for the administrators of the competition to add new sponsors and input their own information into each page, with a content management system now in place. 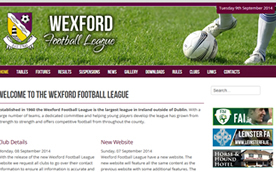 Wexford Football League are the governing body of men's association soccer in Wexford. Boasting a large network of clubs and prestigious players the league has grown in stature from year to year. Aztec Design worked with the league administrators to get the website updated with additional features, yet keeping with the ease of use of updating the website with fixtures and tables. 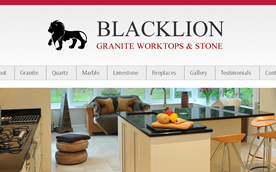 Blacklion Stone are a top quality stone merchants based in Carlow, offering you Irelands best range of marble, quartz, limestone, granite and more stone products. Supplying and fitting worktops, bathroom counters, fireplaces and more for over 25 years Blacklion Stone are Ireland's leading stone merchants. Aztec Design completed the website for Blacklion after consulting with managing director Eamon, who had a firm grasp of what he was looking for in the development of the site. Gorey Institute of Beauty are Wexford best school of beauty, offering a range of courses that are ITEC approved and run by qualified and experienced training professionals. 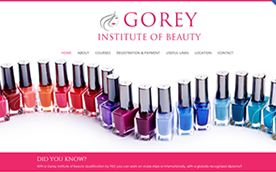 The website for Gorey Institute of Beauty offers a mobile version, it has an effective slideshow, it has an online payment option, registration form and more. Stairs, Furniture, Conservatorys and more, just some of the services an offer at Kinsella Joinery Workshops Wexford. The work Noel Kinsella provides from his workshop and his experience and professionalism has seen projects big and small completed nationwide. 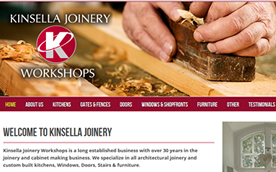 The website for Kinsella Joinery Workshop was built in the same week after our introduction to their business. It features varrious photo gallerys and boasts a mobile version and more special features. 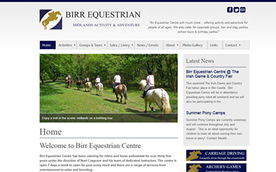 Birr Equestrian Centre are a long running and well established riding school, equestrian center and family fun activity centre based in Co. Offaly. The center caters for a variety of different activity, from pong rides and country treks to children's birthday party's and archery. 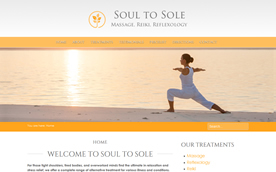 Maria Bulter is a qualified massage instructor who also provides services such as Reiki and Reflexology from her studio in Rosslare, south Wexford. Her services are beneficial for a variety of illness and conditions and care is taken to ensure her clients receive the best treatment possible. Aztec Design completed a revamp of Maria's website and provided her with assistance with the ongoing maintenance of the website. 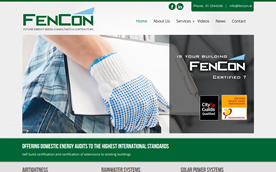 Fencon Limited offer a range of home energy efficiency and green solutions, as well as energy consultancy and related services. If you are looking for a rainwater harvesting systems or would like to find out more about airtightness and how it can help in a variety of ways give the team at Fencon a call. Fencon's website was developed with the Fencon users input, and utilizes a content management system so they can frequently update special offers and news items. Kelly Construction are a family run and operated general builders that cater for a variety of constructions needs. With over 30 years experience and an army of satisfied customers Kelly Construction are a very accomplished team. 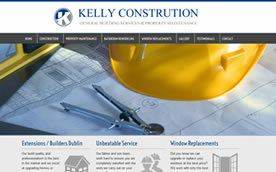 Be sure to view the photo gallery on the kellyconstruciton.ie website and see the top class jobs complete by the team. 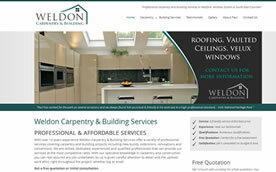 Aztec Design developed the website for the company after discussions and requirements from Mark of Kelly Construction. The website is responsive and features an effective slideshow and photo gallery. Printing, Signage, Vechicle/Van Wrap and election posters, Kinsella Sign & Print do it all. 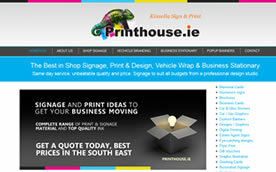 Whether you are looking for business cards or a popup banner for your business the price and quality of the experienced team at Printhouse.ie cant be beaten With over 25 years of satisfied customers Kinsella Sign & Print have you covered for all your printing & signage needs from Gorey to Arklow & Wexford. Aztec Design worked with the team at Kinsella Sign & Print Gorey to update their website to something more presentable and modern. If you based in Ireland and are looking to upgrade your single glaze windows to double or triple glaze systems get in touch with the team at Cozyglaze today. They offer Ireland's number one window conversion service with all kinds of upgrades at unbeatable prices. 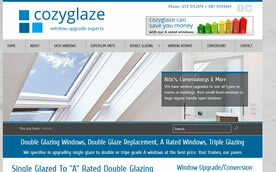 We were delighted with work with the team at Cozyglaze to upgrade their website, just like they are delighted to upgrade homeowners windows! We developed new branding, a new website and worked on the companys SEO. Wexford Youths are an excellent sporting institution in the South East and even feature a senior team that complete in the Airtricity League. 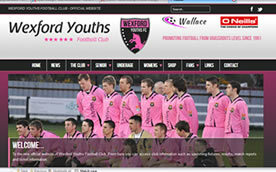 The club develop and nurture the best footballers in Wexford from underage levels to senior team. Aztec Design worked with the administrators to develop the website with a strong emphasis on social media integration and a fans area. 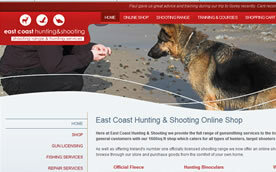 Aztec Design developed a website for Easy Coast Hunting & Shooting that portrays all their services, from training to their shooting range. 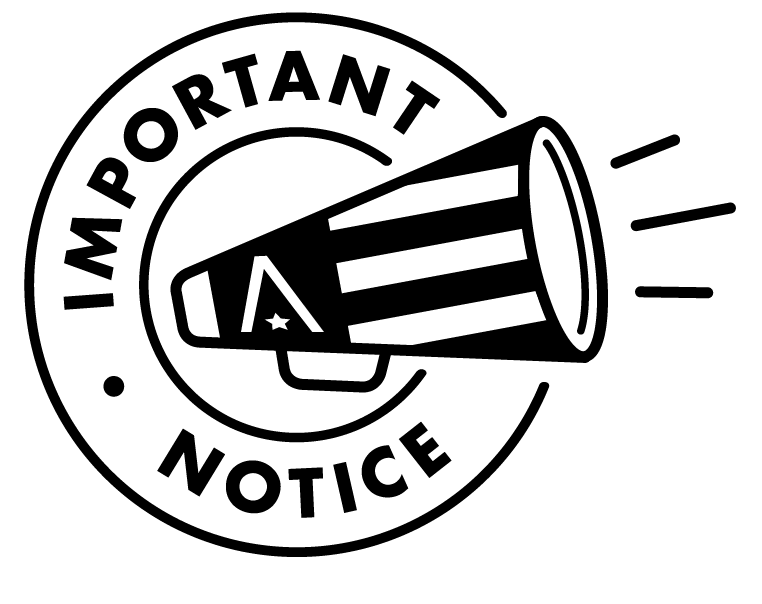 There will also be an online shop coming later. 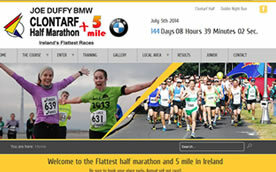 Run Clontarf is one of Irelands most popular races and a fix in any racers calendar. Taking place in July this event is sure to be as successful as the last few. Aztec Design revamped the existing Run Clontarf website to give it a more modern look after consultation with organiser and entrepreneur Eoin Ryan. We also setup a new website to work alongside, the Dublin Night Run. 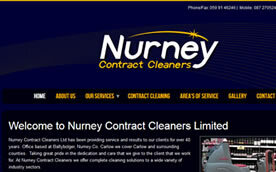 Nurney Contract Cleaners are a professional cleaning company based in Carlow and offering their excellent family run cleaning services throughout Ireland. Window Cleaning, Carpet Cleaning, Office Cleaning and Floor Cleaning - Nurney Cleaners offer it all! Aztec Design developed a responsive website with content management system for Nurney Cleaners, as well as providing them with business cards to match their new website. 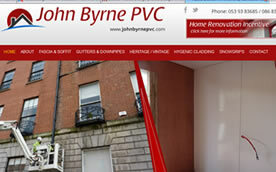 John Byrne PVC supply and fit a vast range of fascia, soffit, gutters, downpipes, snowgrips and also hynegnic classing. They also cater for new and existing domestic and commercial properties throughout Leinster. The website work completed with John Byrne PVC also features a new logo and the administrators at John Byrne PVC were supplied with a user manual to make updating the website easy. 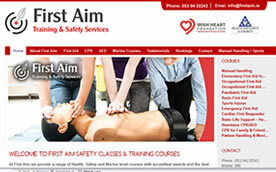 First Aim are a team of fully qualified and registered tutors who excel in providing first class training courses in safety, marine and CPR. The courses are fully certified and can be run on site. We worked with the owners of First Aim to design a new logo and supplied them with an excellent easy to use website as well as flyers to match their new branding. 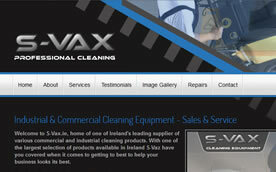 S-Vax are Irelands leafing supplier of various commercial and industrial cleaning products. With one of the largest selection of products available in Ireland and based in Carlow S-Vaz have you covered when it comes to getting to best to help your business looks its best. Aztec Designed created the logo for SVax and set them up with a website they can easily update and manage themselves. 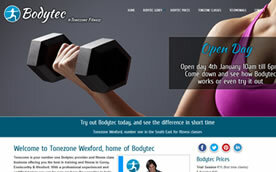 Bodytec Gorey are bringing the latest craze in fitness in Ireland to Gorey and north Wexford - Bodytec. This revolutionary system allows you to undertake a complete body workout in under 20 minutes. As well as offering this new system in Wexford there are various fitness and pilates classes being operated in Gorey, Enniscorthy and Ferns. Visit the website and find out more about this new system, as well as viewing what fitness classes are available in Gorey, Enniscorthy and Wexford. The Fitness Tailor is a new venture started in Gorey providing personal training, fitness, studio and gym hire. The Studio is run and operated by Emmet Gregan who is a sports enthusiast and has excellent skills and experience in sports, health and fitness. 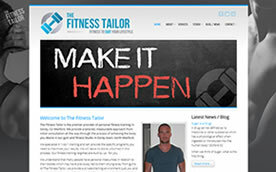 The website for The Fitness Tailor is a responsive design, is editing directly by the team at the Fitness Tailor and features an effective background image that is used in various branding and promotional material of the Fitness Tailor. 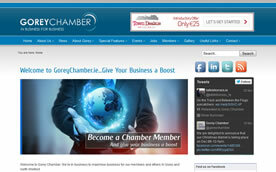 Gorey Chamber of Commerce had their website revamped with Aztec Design Wexford recently. The new website features a members directly, social media integration, useful information about Gorey and allows viewers to comments on aspects such as the "Have your say" feature and more. The website also has a useful photograph gallery and useful information about Gorey town and the surrounding area's, separated into different sections. The website is easy to find your way around and navigate. It also features an online payment system, allowing the collection of renewal fee's and other items. 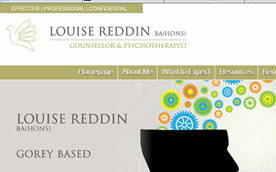 Louise Reddin holds a BA in Counselling, Psychotherapy and Psychometric Testing and a BA Hons in Counselling and Psychotherapy studies and offers a range of related services from her offices in Gorey Business Park. Working with clients of all demographics and age Louise's talents and expertise are second to none and her strictly confidential services are highly recommended. 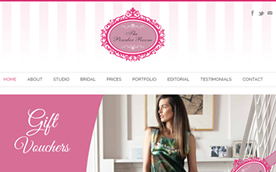 Aztec Design developed a website that Louise can easily manager herself, as she wanted to be very hands on when it comes to promoting her business and marketing. The website features a news blog and social media integration, with the blog very useful for those looking to get tips and information on subjects relating to Louise;s field. We also provided Louise with a new logo, business cards and flyers. The Wedding Gallery in Monaghan is a fantastic bridal boutique based in Carrickmacross and offer's a large selection of dresses and gowns from only the top designers. Pauline the proprietor is glad to take her customers through the selection of whats on offer and help make the most of your big day. The new Wedding Gallery website works great with the business colours and theme, with Pauline also availing of business cards and flyers to compliment her new website. There is a large social media aspect to her new site and going forward there will be even more dresses on view. 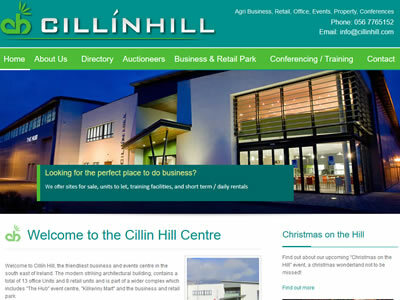 Cillin Hill, the friendliest business and events centre in the south east of Ireland. The Business and Agri Center plays host to a large number of multinationals, small local business's and companys. Based in Kilkenny this modern and carefully planned center is a hub of business and innovation in Kilkenny city. Cillin Hill has a static brochure website that needed updating to portray everything that Cillin Hill offers, from offices of varying sizes, to showrooms and The Hub, the premier entertainment venue in the South East. 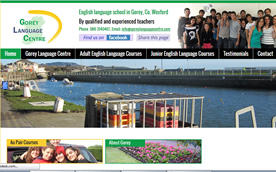 Gorey Language Centre is a well established English Language School based on the outskirts of Gorey and offering excellent tutoring from qualified and experienced teachers. The centre offer excellent rates and assistance with host family's, au pairs and more. Aztec Website Design Wexford work with Avril, the business owner to get the updated website up and running. Along with building the website, based on Avril's requirements we designed and printers matching flyers for the centre. 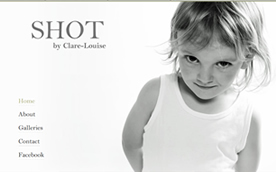 Clare-Louise is a talented photographer based in County Wicklow. As you can see from her website Clare excels in her field and is available for hire for personal photoshoots, confirmations and special occasions at excellent rates. We worked with Clare-Louise to setup her website based on her exact requirements, showcasing just one of her favorite snaps on the homepage. Be sure to check Clare-Louises website regularly as she updates her photograph galleys frequently. 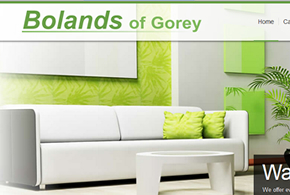 Bolands of Gorey offer one of Wexford finest and largest showrooms of furniture, carpets, wallpapers and floorings. A family run business, Bolands is well renowned and regarded as providing north Wexford with a one stop shop for all home decorating and furnishing needs. If you are in the Gorey area be sure to visit the furniture showroom, located on St. Michael s road. We were happy to work with the Bolands to get their long intended website off the ground in a short space of time. The website features social media integration, a nice homepage slideshow and information on all the services offers at Bolands of Gorey. Tres Chich is Beauty Salon and Laser treatment center based in the heart of Gorey. Established in 1997 the salon is the longest opening Salon in Gorey and over the years has carefully researched treatments so as to offer the best in a range of health and beauty treatments. Tres Chic's new website incorporates the business colours and branding, and displays an impressive welcome screen on startup. Aztec Design also provided the business with professional Facebook images to use as the primary cover photo and profile photo. 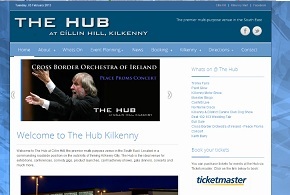 The Hub Kilkenny is a multi purpose large exhibition and events center based at Cíllin Hill in the medieval city of Kilkenny. The center plays host to a wide variety of events such as concerts, wedding exhibitions and season activities such as ice skating. The venue is also part of the Cíllin Hill business and retail park, and regularly hosts some of the larger livestock markets operated by Kilkenny Livestock Mart. Aztec Design worked with the team at Cíllin Hill to upgrade the website, and its part of a larger project to update the group of websites. 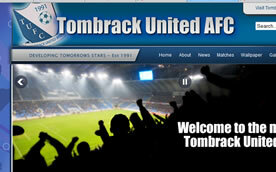 Tombrack United AFC are an amateur football club based near Enniscorthy, County Wexford. The club have teams in a range of divisions across all age groups, including ladies soccer. Tombrak had formerly used a static brochure website which made it difficult for them to update results and scores without too much computer knowledge. Aztec design built them a new website with professional stock images, an image gallery, a contact form and slideshow and based this all on a content management system, making it easy for the club to update their new improved website.